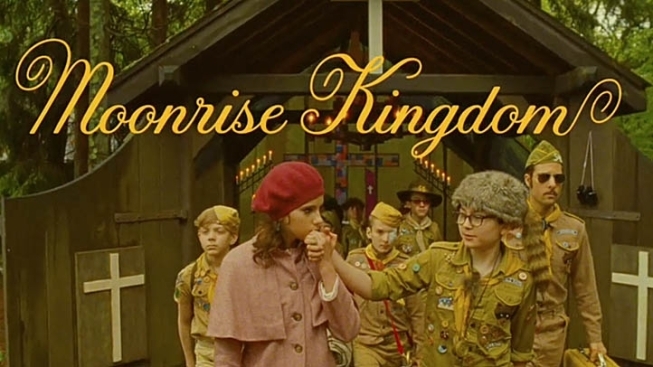 The moon isn’t the only thing on the rise in Wes Anderson’s “Moonrise Kingdom”: a pair of stars are ascending as well. The sweet – and, of course, quirk – romantic film introduces two promising young actors, Kara Hayward and Jared Gilman, who effortlessly steal scenes from established veterans like Bill Murray and Bruce Willis. With the film, which was nominated for the prestigious Palm ‘Or at the Cannes Film Festival and shattered indie movie box office records, heads into a wider release, we took the chance to get to know the newest members of Anderson’s ensemble players. How did Wes Anderson discover you for this? Kara Hayward: Well, it started for me when my dance teacher told me about an open call that was going on near where I lived. I figured that it might be something that I'd try just for fun, so I went and about a week later they called me and asked me if I'd like to meet Wes Anderson. Then about a week after I met him they called and said that I had the job. So it was pretty quick! Jared Gilman: Not as quick as her, by far, but yeah, I have a manager and I was going on auditions. Then, in September 2010, I went on the first audition for 'Moonrise.' Then about six months and three callbacks later, on March 1st, 2011, I was coming home and my mom picked me up from school – which she never does – and over her Bluetooth my dad told me that I got the part. Wes had you write letters to one another as Susie and Sam that later played a part in the film. Gilman: Before filming one of the things that Wes had us do to help us get into our characters and get us to know each other a bit better, he had us email the letters that you see in the movie, the 'Dear, Sam' and 'Dear, Susie' letters. He would have us complete them. We did that and about halfway through Wes kind of realized that it would be better for us to actually mail these to each other, like real snail mail and write them instead of emailing. So we did that, and I think that really helped us also, not only to get to know each other and get into our characters, but get into that 1960s vibe of the movie. Hayward: We completed them, so, I believe those are the same that were used in the movie…I suppose in a way I wouldn't use a few of the phrases that Susie uses, but it was also the 1960s and so it was just a bit different. I did have to try to learn to make it feel like it was something that I would say. There are scenes that audiences are unaccustomed to seeing actors your age do – performing together in your underwear for instance. How did you approach those scenes and find a proper comfort level there? Gilman: I just had the mindset that these are the characters – that it wasn't us. These were the characters and this is what they wanted to do, not what we wanted to do. I just told myself that I really had to become the character and really forget any kind of discomfort or whatever. That's what I did, and it really worked. Hayward: And as I mentioned earlier, it's just another scene. How close was the script to your own experiences about love in your life so far? Hayward: Well, speaking from the point of view of a 13-year-old girl, I wouldn't say that love is as strong as what Susie and Sam had experienced, over the little girl type crushes, but nothing quite that deep. Gilman: Yeah, again, same thing from a 13-year-old boy perspective: There's the crush, but I don't really think that I've experienced the caliber of what Sam and Susie's love was, because they had a deep love for each other. They really cared for each other. What kind of relationship did you have to the scouting and camp experience which was much more prevalent then than now? Gilman: Before the movie I was very indoors-y. I never really thought that I would have to actually camp and stuff, but I guess before the movie I did have to learn some stuff like canoeing and cooking over an open fire – cooking a fish. I guess that kind of helped me, learning that. Now I really have this great appreciation for Scouts and people who actually can survive in the outdoors. How alien did that era feel to you two, the '60s? Did you need to ask people explain some of that to you? Hayward: Well, really, once you're on the set and you're in your costume, the sets are so detailed and amazing that you really do feel like, 'Huh, so this is what it's like to live in the 1960s.' It's such a different life. How familiar were you two with Wes Anderson and had you seen any of his films prior to getting these roles? Gilman: I had seen 'Fantastic Mr. Fox' in the theater and I had heard of his other movies and I had wanted to see them, but yeah, when I heard that at the audition and the callbacks that really helped me, because I really love 'Fantastic Mr. Fox.' It's fantastic! Hayward: I had seen 'Darjeeling Limited,' 'The Royal Tenenbaums' and 'Fantastic Mr. Fox.' So it was purely by chance, and this was even before I had done the first open call. So, when I learned I was going to be working with the man who made these films it was an absolutely amazing feeling. Kara, did you find yourself drawn to his particular style of film, having seen so many of them? Hayward: I was definitely drawn to it. He creates such a vibrant world for his characters, just such an amazing background. Then the characters – it's like he places them so perfectly and who they are and there are always reasons for everything that happens in his films and I just love to see the stories that come alive like that. You talked about trying out for fun. Was this indeed fun, or were you surprised at how much work it was? Hayward: It was SO much fun! It's something that I want to do for the rest of my life, and I couldn't be happier. Even when you leave, that's probably the hardest part about filming: leaving the family that you've come to create with everyone. But then it's also a happy feeling to know that now you're going to get to show everyone what you accomplished and what everyone accomplished there. Gilman: Yeah, it was great and something that I've kind of found out, now since the movie is coming out, just the amazing payoff that you get when you get to watch the movie in front of an audience and see how they receive it. The payoff of all that work that you did is just amazing. Like, you could say a joke, but it wouldn't really land until the premiere or until people get to see it. 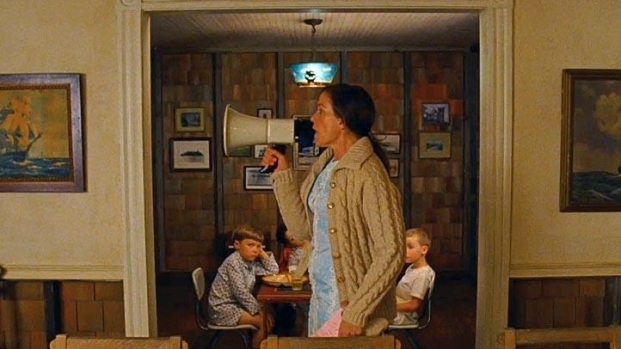 What kind of insight did you get in working with, like Frances McDormand, Edward Norton, Bruce Willis and Bill Murray? Hayward: They were all so sweet and kind and funny and I loved them all. The two who I got to work the closest with were Bill Murray and Frances McDormand because they played my parents. Bill, he's hysterical off-screen, onscreen, wherever he is. He's always making you laugh, and Fran is just such a sweet, down-to-earth person. They were amazing. Gilman: Everyone on set, they were all really great and I was really excited to work with everyone because I'm a huge movie buff. I was a big fan of everyone, and so it was a pleasure…Bill Murray told me that in the mornings I should hum to really wake up my voice. When we were on set, I told that to Kara, that Bill Murray told me that. Then Bill Murray also taught me how to tie a tie. I was doing a costume fitting for a costume where I had to wear a tie and I didn't know how to tie a tie because I never really had to wear a tie. In fact, the first time I ever saw a tie I screamed and ran around the house yelling, 'No tie! No tie!' Everyone in the room, they were all women and so they didn't know how to do it either, but Bill just happened to be in the room right next to mine. He looked over and he said, 'Jared, come over here. I'll teach you.' I went over and he maneuvered his hand and he showed me how to tie a tie. Hayward: Bill Murray was full of wisdom.